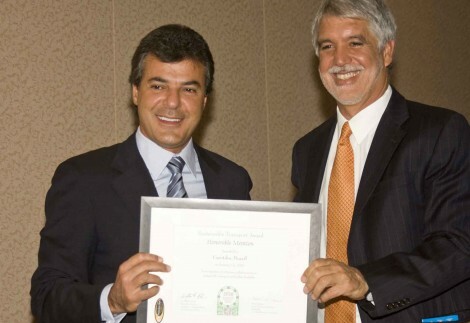 The mayor of Curitiba, Beto Richa received on Tuesday night (12th) in Washington the Sustainable Transport Award 2010 for the implantation of the Linha Verde (Green Line). It is the first time that a Brazilian city wins this award from the Institute for Transportation and Development Policy (ITDP). “More than an incentive, this recognition extends our responsibilities with the construction of a sustainable society, question that will not be equated without a public transport system characterized for the excellence of its quality” said Richa in his gratefulness speech. The Sustainable Transport Award, is annually offered to the best public transport projects of the world. It is organized by the United States ITDP and a commission composed of more eight international institutions: the ONU Regional Development Center; Environmental Defense Fund; Transportation Research Board Committee on Transportation in Developing Countries; Clean Air Initiatives for Asia; Clean Air Initiatives for Africa; GTZ (Deutsche Gesellschaft für Technische Zusammenarbeit); EMBARQ (The World Resources Institute Center for Sustainable Transport) and International Association of Public Transport (UITP). “With the Green Line, Curitiba continues the tradition of sustainable transport. Curitiba is one of the first and better examples of efficient and plain urban transport focused in the environmental sustainability” said Enrique Penalosa, president of the Institute for Transportation and Development Policy. The Linha Verde at night! 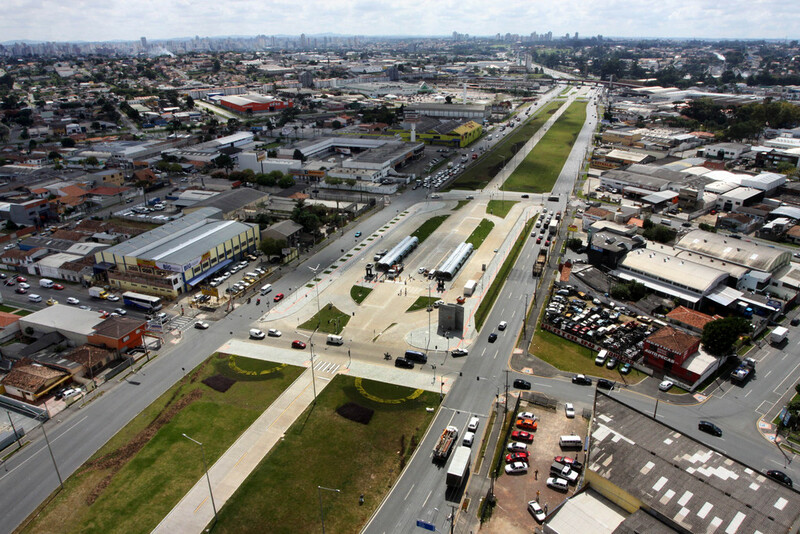 “The Linha Verde impressed the members of the committee with a really modern transport corridor set up with traffic lanes, ciclovias, sidewalk and parking, forming a complete avenue”, said Enrique Penalosa, ex-mayor of Bogota that also won the Sustainable Transport Award in 2005. 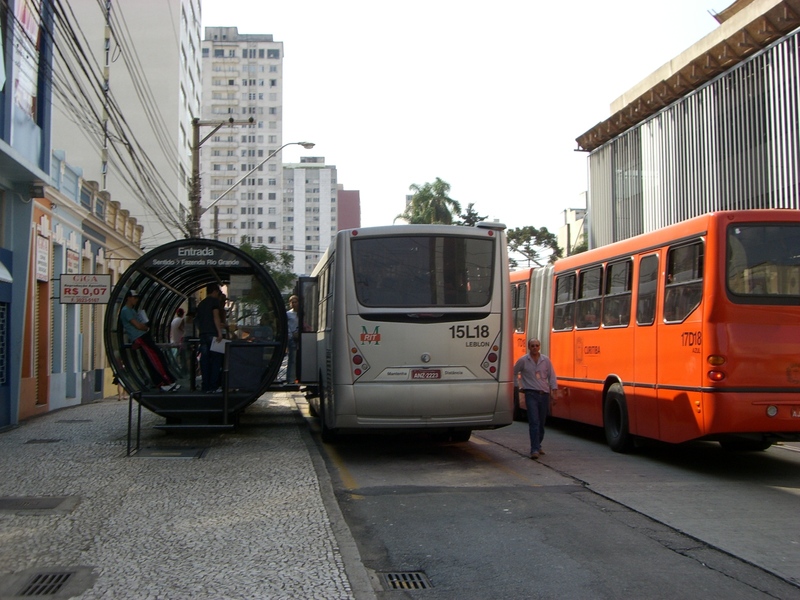 “Curitiba launched the innovation in the public transport. Everyone recognized that the Curitiba city deserved the nomination and the prize” said Kathryn Phillips, specialist in transport politics of the Environmental Defense Fund, in Sacramento, California. The other nominees cities announced to run for the Sustainable Transport Award 2010 are Ahmedabad (India), Johannesburg (South Africa), Cali (Colombia)and Guadalajara (Mexico). 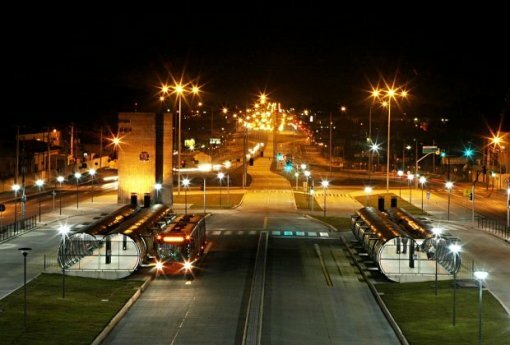 All of them were also awarded for its projects inspired by the exclusive Curitiba’s transport system world-wide known as BRT (Bus of Fast Transit). Click here to see their projects, its strengths and weaknesses. The Green Line is the sixth transport corridor of Curitiba and its construction began in 2007. It was implanted in the old BR-116 and transformed into a complete and great traffic area. Besides ten traffic lanes, the avenue has exclusive BRT (Bus Rapid Transport) lanes, fast lanes, access lanes, parking lanes, bike lanes, pedestrian lanes, sidewalk and a leisure area is being built. 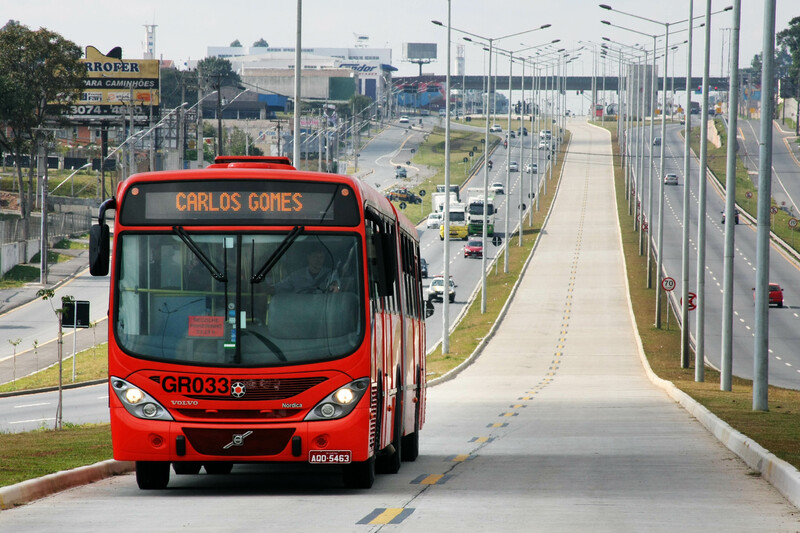 The Green Line allowed the implantation of new bus lines that connects some suburb areas to downtown faster .The first one to be created was Pinheirinho-Centro, reduced in 17% in the trip time. The line has also the first buses in Latin America to use biodiesel, made from soy base. For more information about it check the post “The First 100% Biodiesel Buses in Latin America Starts to Circulate in Curitiba!”. Check out the great tour "Curitiba like locals: Urban Planing"
If you are coming to Curitiba and want to experience and see how the Linha Verde (Green Line) works, check out the tour “Curitiba like locals: Urban Planning”. Curitiba, capital of the Brazilian state Paraná 400km south east of São Paulo has over the last 30 years developed a non subsidiside, private owned, public transport system. Today it stands as a model recognized internationally. In sightful, long term planning with several innovative solutions has provided the citizens with an effective system that gives priority to public instead of private transport. It has the highest user rates of all state Brazilian capitals, 75% of all weekday commuters. All this during an unprecedented city growth. Also, check out the tour “Curitiba like locals: Urban Planing”, a private tour where you can get the chance to see how locals use the great Curitibas’s public transportation system and also get more information about how Curitiba developed it in the last decades. Well recomended! Developed and developing nations are being challenged more than ever to provide a good quality of life for their inhabitants while coping with population growth. Curitiba, the most environmentally friendly city in Brazil, is flourishing by meeting these needs. Through embracing sustainable development, it has become an important reference among these communities in terms of planning, public policies, and successful strategy implementation towards environmental sustainability. With 1.7 million residents, Curitiba has grown through calm, harmonic urban solutions that respect individuals and cultures and preserve the environment while sustaining its cosmopolitan cultural identity. This setting makes Curitiba an example for the rest of the world. Most of the policies that transformed Curitiba into a model of environmental sustainability were initiated by Jaime Lerner, Mayor of Curitiba during Brazil’s military regime in the late 1980s. He and a working team designed and implemented the urban master plan, which included integrated initiatives of green areas, waste recycling, and transportation projects. Today, the public transport system accommodates 2 million passengers daily and is the main source of transportation for 54 percent of the city. Most Curitiba citizens embrace the city’s commitment to environmental responsibility as part of their collective subconscious. The exhaustive marketing and educational campaigns that were carried out during the military regime have been maintained and reinforced during the democratic mandates that have followed. Citizens have incorporated environmental awareness as part of their lifestyle. Curitiba started its green transformation with the development of an integrated plan for basic sanitation and environmental preservation. When in the early 1970s the United Nations declared that every urban inhabitant should have a minimum of twelve square meters of green area, Curitiba had only a half-square meter per inhabitant. The city implemented various strategic changes, and today the green area per inhabitant is fifty-one square meters. Through land expropriation, the city government offered new sport and leisure spaces while preventing illegal land occupation by those without explicit right to the property. They also created ponds and lakes by containing rainwater at a cost fifty times less than a typical channel network. These green areas are spread among thirty forests and parks that have become highly valued meeting points for the population. Several of them are allusive to important local history, honoring the arrival of immigrants and the native habitants, the Tingui Indians. Because immigration contributes to the multicultural accent and development of the region, Curitiba’s green spaces represent its culture with free public libraries of various languages and open spaces that host annual cultural and gastronomic celebrations. The authoritarian government, which reigned from 1964 to 1985, sustained Lerner’s foresight, but the successes of his administration ultimately led to his democratic reelection. Additional projects improved the strategic use of the extensive green areas in an inclusive way. UNILIVRE, the free university for the environment, is the first of its kind in the Americas. UNILIVRE holds workshops for environmental awareness and education for people of all ages, backgrounds and socioeconomic conditions. A few of Curitiba’s most notable successes are its solid waste management and recycling programs. The city established an industrial landfill through a public-private partnership near the assigned industrial development area. At the landfill site, they neutralize toxic waste (such as batteries) and reuse other materials for cement production. Additionally, they collect and process cooking oil to be reused for soaps and fuel. Finally, they introduced a particular process for clinical and hospital waste to be sterilized before being sent to the organic landfills. Curitiba was the first city in the country to practice selective garbage collection by separating organic from inorganic waste. The municipal service collects an average of 1200 tons of organic waste and thirty tons of recyclable materials daily, and independent collectors gather an additional forty-five tons of recyclables daily. Through “Cambio Verde” (green exchange program) another thirteen-and-a-half tons are exchanged. This program exchanges four kilograms of recyclable material for one kilogram of food at over eighty-eight points in the city twice a week. Recyclables are a profitable source of income not just for the lowest quintile of the local society, but also for the other stakeholders in the recycling system. The majority of the collected materials are donated to the Pro-Citizenship Institute (Instituto Pro Cidadania de Curitiba, or IPCC), a local NGO. IPPC separates, compacts, and sells the material to surrounding recycling factories, giving a source of income to over sixty employees. Another group that benefits from municipal assistance with recyclable material are the “ecociudadanas” cooperatives. The city provides groups of twenty to twenty-five citizens, mostly women, with a physical space to keep, select, compress and sell the recyclable materials they collect. This system allows them able to double and sometimes triple their regular income while also obtaining healthcare, childcare, and education access for them and their children. As of July 2008 nine ecociudadano cooperative groups existed, and given their successes, the local government is continuously opening more. The most likely obstacles that other local governments will face while trying to integrate these policies in their municipalities are budget restrictions. Surprisingly, the expenses for such a progressive system are relatively limited. In 2006, expenditures for the Environmental Department represented just 1.4 percent of Curitiba’s annual budget. However, the annual expenditures for urban development and education were 39.8 percent and 18 percent of the annual budget for Curitiba, respectively. Sustainable planning requires a willingness to invest and cooperate with the private sector, and Curitiba demonstrates how this commitment efficiently promotes environmental preservation. Curitiba is far from being an ecologic sanctuary, but the “green” attitude of Curitibans has taken them in a positive direction and has transformed the city into an important reference worldwide, inviting others to be creative and value citizens’ input as a priority for environmental conservation. Curitiba, along with other cities such as Portland, OR (USA), Geneva (Switzerland) and many others as in Germany and Sweden, is a living model for other cities that want to implement sustainable living policies. As a blossoming city in a developing country, Curitiba is an inspiration for other cities in this context to overcome economic resource constrains and address the same sustainable challenges. Daniela Ochoa Gonzalez is a 2009 MPA Candidate in CIPA concentrating in environmental policy. Check out the tour “Curitiba like locals: Urban Planing”, a private tour where visitors can have the chance to see how locals use the great Curitibas’s public transportation system and also get more information how Curitiba developed it in the last decades. Well recomended! Travel to Parana · Touristic and General Information about the Brazilian State of Paraná!